Bottle gourd / lauki is grated and salted. It is then squeezed and mixed with wheat flour into a dough. The dough is rested for sometime and is rolled out into thin parata. 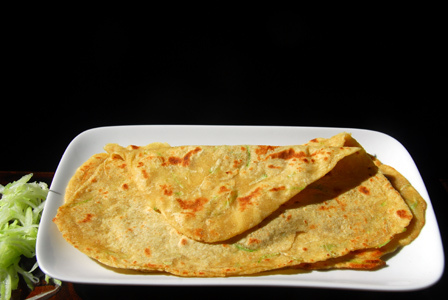 The bottle gourd paratha is then fried on flat pan till golden brown in color. 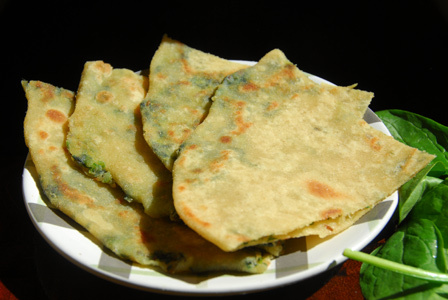 Makes: around 2 Bottle gourd Parata. Peel the bottle gourd, wash and grate it. Add few pinches of salt to the grated bottle gourd and leave it aside for around 10 – 15 minutes. Squeeze the grated bottle gourd and reserve the liquid. Alternatively coarsely grind the green chiles and ginger. In a mixing bowl, mix together wheat flour, squeezed bottle gourd, green chile ginger mixture and salt. Add little bit of reserved liquid at a time and knead the mixture into non sticky dough. Add water if necessary. Leave the dough aside for around 1/2 hour and divide it into 2 portions. Smear few drops of oil with the help of a spoon on the rolled out portion and close to form a semi circle. Spread few more drops of oil on the semi circle and close it into a triangle. Press lightly, dust some wheat flour and roll the triangular shaped dough into somewhat thin parata. Repeat the same with the other portion of wheat dough. When pan gets hot, place one rolled out bottle gourd parata on the pan. Fry on one side till brown spots appear and turn on other side and pour a quarter tsp of oil (if using) around the parata. When you see brown spots on the other side, remove from heat and place in a closed container to keep them soft. Repeat the same with remaining rolled out parata. 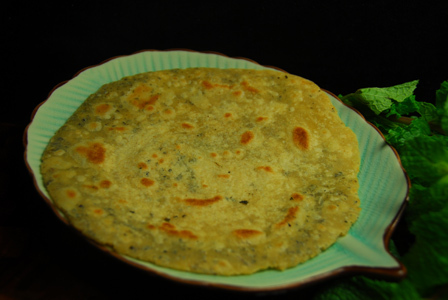 Serve bottle gourd parata with your choice of raita or pickle or serve with simple kadhi. Suggestions: If the paratha is not cooked properly, put it back on low heat and cook till its done. Variations: You can also grind the bottle gourd into coarse paste using a grinder instead of grating it. Other Names: Bottle gourd Parata, Anapakaya / Sorakaya Paratha. Old fashioned oats / rolled oats are ground into fine powder for this recipe. The ground rolled oats are mixed with wheat flour and other spices and herb into a soft dough. Dough is rolled out into parata and cooked on low flame till the paratha is done. Serve oats paratha with any raita of your choice. Makes: around 6 Oats Parata. Grind oats into fine powder using a grinder. In a mixing bowl, mix together wheat flour, oats powder, sesame seeds, green chiles, cilantro and salt. Knead oats mixture soft dough using enough fresh water. Keep the dough covered with wet kitchen towel for at least few hours. Take each portion of oats dough, press it a little to form a small disk. Carefully knead each dough ball into around 8 inch diameter disc with help of a rolling pin. Repeat the same with remaining oats dough portions. 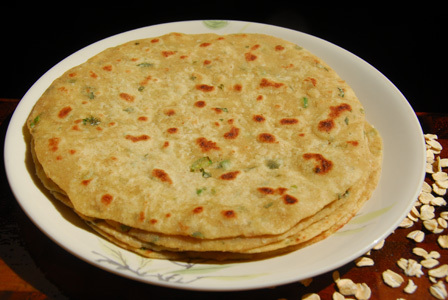 Place the oats paratha on hot griddle and let it turn light golden brown with dark spots. Add few drops of oil on uncooked side and turn it over to let it cook covered for few seconds. When both sides are cooked properly, remove oats paratha onto a plate. Repeat the same with remaining rolled out oats parathas. Serve hot oats paratha with any raita of your choice. Suggestions: If the oats paratha is not cooked properly, put it back on low heat and cook covered till its done. Also, grind the green chiles into paste instead of chopping them before adding to the oats mixture. Variations: Check other parata recipes here. Notes: Adjust the thickness of the paratha according to one’s preference. Variations: You can also add boiled potato to the spinach mixture instead of the raw potato. Other Names: Spinach Potato Parata.